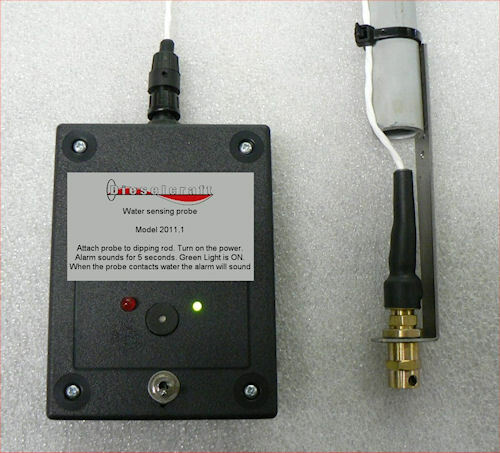 Electronic sensor detects water in gasoline or diesel fuel tanks before problems arise. Fuel tanks, whether storage variety, or those on-board vehicles, are prime places for moisture collection from direct leakage or condensation. Either way, water in the fuel isn't good. Dieselcraft Fluid Engineering has just released its solution to the problem in a line of water detectors designed to detect water before the fuel is dispensed into water separators and filters. Dieselcraft's new water detection unit can check for water in fuel storage and vehicle fuel tanks. On the hand-held units, dip the probe, and if there's water at the bottom, the alarm sounds. The Models 06-5 and 06-6SP are made up of a solid state sending unit and a self-grounding stainless steel probe. The 06-5 is designed specifically to detect water in diesel fuel and gasoline, but will detect water in other fluids with less conductivity than water. The 06-6SP is supplied with an additional output lead to use with a PCL control to send an alarm to shut down equipment contaminated with water. An ABS electronic enclosure houses two LED lights, the green light indicates the sensor has power and is ready to work. The larger red LED will come on and stay on when water is detected in the 06 Series. The unit also incorporates an audible alarm, which sounds 5 seconds to bring attention to the water presence. The new FWS-HH portable water detector is a hand-held unit that can be used in conjunction with the tank dipping process. When attached to the dipping rod, no paste is needed. Turn it on, dip it and if water is in the tank bottom the alarm sounds. For more information and video, visit www.dieselcraft.com.